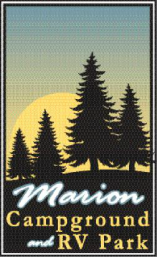 Located in the heart of southern Illinois, Marion Campground & RV Park is opened year-round. Marion Campground & RV Park is conveniently located 1 block east of Interstate 57, exit #53, with easy access to local shopping, restaurants and area attractions. Experience the comfort and convenience Marion Campground & RV Park has to offer. Featuring clean, private showers and a laundromat, our main office is warm, new, and there to meet all of your needs. With a large pavilion, dog walking area, and playground, your stay at Marion Campground & RV Park will be fun for the whole family.